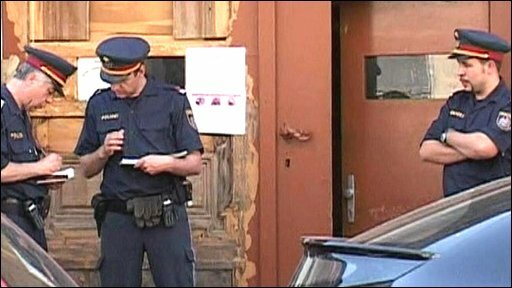 Police in Austria say one of the two Indian preachers who were shot in a violent dispute with a rival Sikh group at a temple in Vienna has died. The preacher, Sant Rama Nand, was attacked during a religious ceremony by six men armed with knives and a pistol. The other preacher Sant Nirajnan Das, who was among 15 other people injured in the clash, was said to be stable. Following the incident, there were violent clashes across the Indian state of Punjab. Indian police said protesters in the city of Jalandhar set fire to vehicles and put up roadblocks. Witnesses said the protests appeared to be a reaction to the fight at a temple in Vienna, which reportedly began when fundamentalist Sikhs attacked the preachers, who, they believed, were disrespectful of the Sikh holy book. The fight involved five men armed with knives and another with a pistol, the BBC's Bethany Bell reports. Sant Rama Anand died of his wounds in hospital early Monday, a police spokesman said. "The surgeon said at first he was satisfied with his patient's condition after an emergency operation," news agency APA quoted the spokesman as saying. "But the patient lost consciousness and died shortly after midnight (2200 GMT)," he added. The condition of the second preacher is reported to be stable, he said. Police spokesman Michael Takacs said the scene was "like a battlefield". Six people have been detained, and more arrests were possible. "Everybody was praying and then it started with knives and a pistol," said eyewitness Nermal Singh. Several hundred worshippers were at the temple at the time of the attack. The temple is situated in Vienna-Rudolfsheim, in the 15th district of the capital. It is estimated that fewer than 3,000 Sikhs live in Austria. The Rudolfsheim temple is run by devotees of Shri Guru Ravidas, who founded a sect called Dera Sach Khand. Meanwhile, there were violent clashes in the city of Jalandhar in the Indian state of Punjab. People have poured out into the streets by the thousands and have been protesting since Sunday evening, says the BBC's Asit Jolly in Chandigarh, the capital of Punjab. The protesters set fire to vehicles and damaged government buildings. "The whole thing has spread out of Jalandhar now, it's in all the nearby towns and a curfew has been imposed across Jalandhar city, and the latest I'm being told is that the government of Punjab has requisitioned the army to be on standby," our correspondent adds.